Israel expanded its military operation in Gaza early Thursday, sending in tanks and troops to pressure Hamas militants firing rockets into southern Israel and holding a soldier captive. Israeli officials insisted Wednesday that they had confirmed reports that that the captured soldier, Cpl. Gilad Shalit, 19, was still alive and there were also indications from international mediators that those holding him may now be prepared to moderate their position and do some serious talking, reports CBS News correspondent Sheila MacVicar. 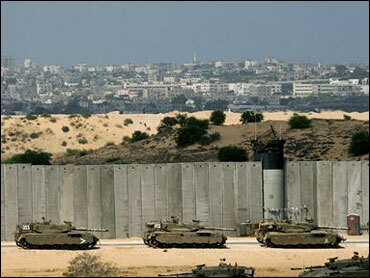 The move came after the government on Wednesday authorized the army to enter populated areas in northern Gaza. The decision by the Security Cabinet to step up a ground offensive indicated Israel may be prepared to partially reoccupy Gaza less than a year after withdrawing all troops and settlements from the area. Before daybreak, troops and about 15 tanks entered an area of northern Gaza just across the border where three Jewish settlements stood before Israel's September pullout from the coastal strip, according to an Associated Press reporter who saw the troop movements. The settlements were destroyed just after the pullout. The new line stretched across most of the narrow northern part of Gaza. The military would say only that its forces were operating in northern Gaza. As the ground forces edged forward, Israeli artillery and aircraft struck targets in the area, aiming at bases and groups of militants. Hamas officials said one militant was killed and another wounded in an airstrike on the Gaza beach early Thursday. The military said aircraft hit an armed militant. In another incident, two people, a Hamas militant and a Palestinian policeman, were killed and 11 others wounded in an explosion on the northern Gaza beach. Palestinians said Israeli tanks or gunboats shelled the area. Israel denied that, but the military was checking whether there was an airstrike. A car carrying reporters from the Al-Jazeera Arabic television channel came under fire from Palestinians in northern Gaza, and two were wounded, according to one of the reporters, Wael Dahdouh. He said the gunmen apparently thought the reporters were Israeli undercover agents. Meanwhile, Israeli forces remained in southern Gaza, where they invaded after a June 25 attack by Palestinian militants on a border post in which two Israeli soldiers were killed and a third captured. Israel said a main goal of the military operation in Gaza continues to be winning freedom for Shalit, who is 19. Israel says Hamas declared war when it kidnapped the Israeli soldier 10 days ago, reports CBS News correspondent Robert Berger. Thousands of Israeli troops and armored vehicles were poised on the Israel-Gaza border, prepared to clear out a buffer zone in northern Gaza to push the militants and rocket launchers back. The push into Gaza came after Hamas militants fired improved, longer range rockets into the heart of a major city in southern Israel for the second straight day Wednesday. A homemade rocket exploded in Ashkelon, a city of 110,000 that used to be out of range. Hamas, the Islamic militant group that runs the Palestinian government, claimed responsibility. No one was hurt in any of the rocket attacks, but it was the first time rockets have penetrated so far into Israel, showing militants have improved the range of the primitive weapons. Rockets also hit another Israeli town, Zikim, near the Gaza border. Prime Minister Ehud Olmert met with his Security Cabinet and top military officials Wednesday to decide which parts of a broad invasion should be immediately implemented. The Security Cabinet, made up of 16 senior ministers, decides on pressing defense issues. Participants in the meeting said the Security Cabinet agreed a standing plan by the army to create a buffer zone in northern Gaza could be an effective way of preventing rocket fire. Olmert's office denied the Cabinet had approved the formation of such a zone. Israeli forces and settlers withdrew from Gaza nearly a year ago and destroyed all 21 Jewish settlements there. To carve out a sufficiently wide buffer zone to protect Israeli towns from rocket attacks, the army might have to go into densely populated areas of northern Gaza, where it can expect fierce resistance from Palestinian militants. Israel Radio reported at daybreak Thursday that troops would not enter the Palestinian towns for now. "There will be steps taken and they will be very serious," said Yitzhak Herzog, a minister in the Security Cabinet who attended Wednesday's meeting. "There is a very broad operation here. It will continue." A statement from Olmert's office gave no details about the military operation, but said the army would continue to go after Hamas militants and their infrastructure. It said the army has been ordered to "prepare for a phased and continuous" operation. Its main goals remain to find Shalit and to prevent more rocket fire into Israel, the statement said. Israel has massed soldiers on its border with northern Gaza since June 29, but officials postponed a planned invasion as international mediators sought a way out of the standoff over the captured soldier. Justice Minister Haim Ramon said Wednesday he believes Shalit, who reportedly was wounded in the attack, is alive and being held somewhere in Gaza. As Egyptian and Turkish mediators tried to end the worsening crisis, Mohammed Awad, the Palestinian Cabinet secretary, told reporters in Gaza Wednesday that the "Israeli escalation is posing a threat to these ongoing efforts and it must stop." In Cairo, Egypt's mediation efforts ground to a halt because Hamas' Syria-based political chief Khaled Mashaal refused to press for the unconditional release of Shalit and because of growing mistrust between Egypt and Hamas, Egyptian and Palestinian officials said. Mashaal has denied claims by Israel that he masterminded Shalit's capture. Mashaal was turning his attention to Turkey, which has stepped up diplomacy in an effort to end the standoff, the Palestinian officials said. The Hamas-linked militants holding the soldier have demanded Israel release about 1,500 Palestinian prisoners in exchange for information about the captive. On Tuesday, Olmert ignored a deadline to begin freeing prisoners. Israel has publicly refused to negotiate with the militants, but could be indirectly communicating with Hamas through the Egyptian or Turkish mediators. In Washington, State Department spokesman Sean McCormack said Palestinians must release the soldier and stop the rocket attacks. He also called on Israel to show restraint so that in the future, "there is the possibility of a negotiated settlement." U.N. Secretary-General Kofi Annan called on both sides to "step back from the brink." He said the soldier must be released and Israel must avoid collective punishment of Palestinians. At the Erez industrial zone on the Gaza border, which has been shut since hostilities escalated, troops opened fire at Palestinians who were apparently looting closed businesses, wounding a 13-year-old boy in the head, Palestinian medics said. The army said it had no knowledge of the incident. Soldiers also caught a Palestinian militant in the West Bank with an explosives belt strapped to his waist, the army said. The militant was caught in the West Bank settlement of Barkan before he had a chance to detonate his explosives, the army said. Palestinian officials said the would-be bomber was a 17-year-old member of the Islamic Jihad militant group.